characters on his long-running PBS show are there. We never hear "Mr.
Carey's as the real-life visitor to the land of Make-Believe. I couldn't find a picture of the cover (see UPDATE), but I did find this photo of Rogers, Carey, and a few puppets you might recognize. Another thing I noticed on listening to this is that the tune to the song "It's Morning" was later used for one of his closing songs "Tomorrow". The sound isn't quite as good as I usually have (this is a mp3 recording from a cassette copy of the original record that Kip doesn't own), but I think the rarity of this more than makes up for it. Thanks again, Kip! Where Did You Go, Tomorrow? UPDATE: As you can see, I've now got pictures of the front and back covers of this album. These aren't part of the original zip file, so if you want them you'll have to save the images from this post. These pictures are courtesy of Molly, who happens to be selling this very album on eBay and allowed me to use the pics in exchange for including some information from this post in her listing. "The Children's Corner" was produced and broadcast by WQED in Pittsburgh, one of the nation's first public television stations. This is also where Fred Rogers also produced "Mr Rogers Neighborhood" for almost 35 years. Both Fred and Josie are from small towns just outside of Pittsburgh. Hi there, I am so happy i found your blog. I am having the worst time downloading though. It says your out of bandwidth. I am really trying to get Songs that tickle your funny bone, I know my kids would LOVE it as much as I did! What a find! Though I am too old to have memories of Fred as a kid, this reminds of when my own little one was enrapt and absorbing the guy. I actually fell in love with the guy through her. I wrote him a long letter not knowing he was ill and dying some years back. He sent me back a 2 page letter of appreciation, a pair of autographed pix which I had not even asked for, as well as a stack of pix of all the characters from the show. This is truly lovely, and THANKS! Tony, this is the greatest gift you have ever given us, and considering the mountains of unbelievably great stuff you've given us, that's saying something. Incidentally, the track divisions are mine -- it seemed best for each cut to start with a song, and the song titles are my own best guesses. The tape was made in 1983 or so. I wish I'd photographed the covers. Kip, I also want to thank you. Lady Elaine songs are not common to come by, and your sharing is much appreciated! What a beauty! Thank you, T and K. Think this could be the album? 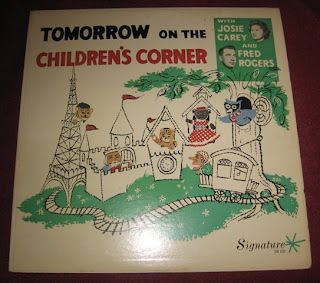 Were there several CHILDREN'S CORNER albums? What a treat to discover this blog. I have the answers to a lot of the questions being asked as I was a viewer of the Children's Corner broadcast on WQED, Pittsburgh. 1. 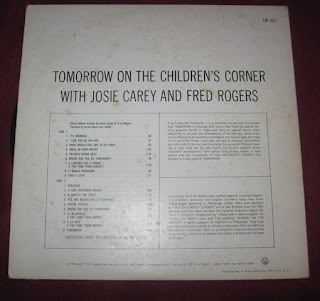 There are two albums that were recorded: AROUND THE CHILDREN'S CORNER and TOMORROW ON THE CHILDREN'S CORNER. Both are sort of a precursor to the 60s Beatle's Magical Mystery Tour. We accompanied Josie Carey as she thought seventeen and a half nice thoughts and magically ended up in the land of make-believe: THE CHILDREN'S CORNER. 2. 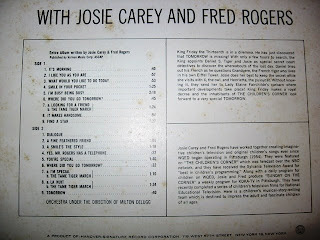 She and Fred Rogers also had an earlier 45 rpm record. On one side was I KNOW IT'S TIME FOR CHRISTMAS and CHICKEN LITTLE--both immensely successful with the post-WWII baby boomer generation, of which I am one. 3. The show was a tremendous success in Pittsburgh and they received 6000 letters a week from their young viewers if you can imagine that. We all flocked to a local amusement park, Kennywood, to see Josie when she appeared at an outdoor pavilion. She was our hero back then. I was also fortunate to be crowned Prince of Calendar Land which happened when the 13th fell on a Friday. We were invited to the studio where we were officially crowned prince or princess. 4. The program also had a puppet, GRANDPERE (grandfather) who taught French to young viewers. Actually, it was Fred Rogers who was the voice of all of the puppets on the show. I met him in later years and he spoke fluent and impeccable French. You see, as a result of those early lessons, I became fascinated by this distant land (France) and the language and majored in French in college. Little did they know that this viewer would end up spending his entire working life teaching French. It was so nice to discover this blog and to relive some moments in the past. And yes, I have photocopies of the album covers but actually prefer the on-line pic of the team. Both Josie Carey and Fred Rogers are remembered with fondness. We were fortunate to have encountered their genius. Thanks for the memories, all ! I was born in Pittsburgh in the 1950s. 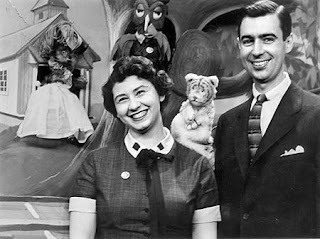 My older brother and sister watched Mr. Rogers on WQED there and then so did I. One of my earliest memories was visiting the studio there and seeing a taping of the show. I was confused by the colors of the set, since I had only known the characters on a black and white T.V. The two albums produced from this era are favorites among all my siblings and we know the dialogue ver batim. Does anyone have a download of Josie Carey's 45 rpm of I Know It's Time For Christmas and Chicken Little? I love that little record! Great job getting the cover art up here! This link got buried when I moved, but I see it's time to check the site more often. Any idea what the album went for on ebay? A bundle, I'll wager. Hello! Wow, I appreciate this website so much!! I was on The Children's Corner when I was 4 years old, so it must have been 1956. Does anyone know if they have archives of the TV shows? Those songs are familiar.... and I also remember one called Good Night God (and thank you for this very lovely day...). Does anyone else remember that? I have the little booklet too - when I find it, I'll let you know and post the images online. Thanks again!